Finding the right spot to target is crucial to a successful carp fishing session. And whether you’re exploring a new swim or casting out from a peg you’ve fished 100 times, you should always be on the look out for spots where the bites will be good. So we asked Deeper Hero and carp fanatic Richard Handel to share his tips on the best features to target for catching carp. Richard fishes a syndicate in Hampshire with 5 lakes and over 8 miles of river, so he has plenty of swims to explore. Carp absolutely love features and hang around them all the time. These areas contain most of their sources of food, and they are also like sanctuaries for them. So, here’s my list of 3 of the best features that carp will hold up in. These features are simple to find and will definitely help you when bank fishing. These are great because they’re simple to find, and more or less every lake has them. When targeting overhanging trees, bear in mind the possibility of fallen branches and other debris. The best thing to do first is just run a lead through the swim – this will help you to determine which part is the to fish. I personally like to fish the gravely area under the trees as this will have been cleared by the carp. Here I’ll use a very bright pop up with a good smell. I have done very well on Frank Warwick’s Masala pop ups, which are bright orange. 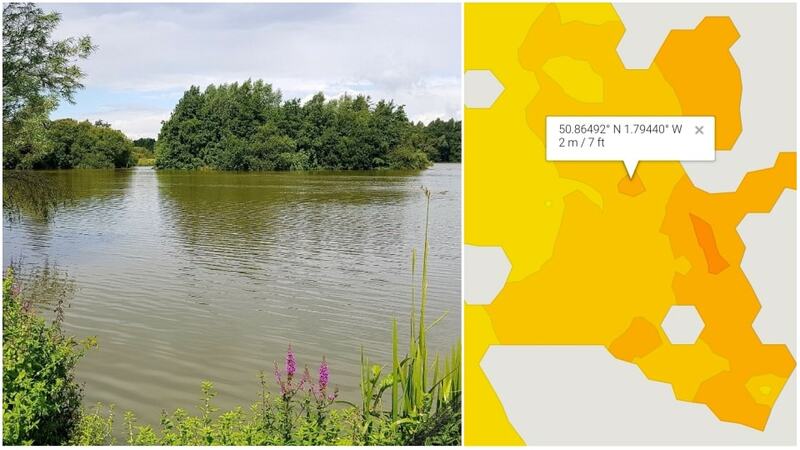 The carp will just be moving through these areas looking for food, so a bright bait will take their interest and hopefully they’ll investigate. It’s best to fish a heavy line (I use 18lb) as there’s always the possibility of zebra mussel or something else that might cut the line, and I like to fish a heavy hook. This is another very simple feature to find, and the carp just love these spots. They have the possibility to hold food and are generally used as patrol routes between different parts of the lake. Carp, like humans, generally cut the corners, so the corner of islands are usually the best areas. Mind you, don’t forget the middle as this will be an under fished part of the lake: if the lake is pressured by anglers, they will cut through the middle. Bait wise I use the same as for overhanging trees. The carp will generally be moving through the area and it will not be a holding area. I have put these three features all under the same category. You will need some help locating and understanding these features. Before the days of castable sonars, there was only one way and that was with a marker float, which took a lot of time. Deeper sonars have solved this problem, speeding up this process 10 fold so you can now find those humps and gullies quickly and easily. Plus finding these spots with a marker float can be tricky and you need a bit of luck on your side. With my Deeper PRO+, I use the onshore mapping mode with GPS. This means I can spot all the humps and indentations. I won’t necessarily look for all of them straight away. Instead I’ll map the lake then when I’m at home I’ll review it all using lakebook and spot them. Here’s one of the maps I’ve made with one I have spotted. I have a look at how the sonar readings of this spot look (I do this on Lakebook too). It’s perfectly clear this is a brilliant spot. From a rig perspective, I have found that the Ronnie Rig is the best all round rig in any situation from pop up, wafter and even bottom bait. This rig is a step forward from the original 360 rig, which specifically used the 360 hook from JRC (no longer made by them) but lucky is now made by Spotted Fin. The same applies for indentations, which are always great holding areas for carp and will produce carp. And gullies are like underwater highways for carp and will take a bit more understanding. Watching the water will help reveal their secrets, but just knowing where they are and which direction they move around the lake is a great starting point. Finding all the above features will certainly help you catch more carp. Be Lucky.